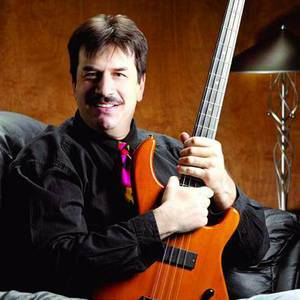 A flexible and powerful electric bassist, Jeff Berlin has been one of the major fusion bassist since the mid-'70s. His father sang opera and his mother played piano. Berlin had nine years of violin lessons starting from when he was five and was considered a child prodigy, appearing with orchestras in New York City. However when he was 14 he switched directions and began playing electric bass; Jack Bruce was an early hero. Berlin attended the Berklee College of Music for a time and then moved back to New York. For a short period he was in a trio with Allan Holdsworth and Tony Williams. In 1975 he recorded in Europe with Yes keyboardist Patrick Moraz and then in New York he became quite busy with studio work, club dates and record sessions. Berlin played with many top musicians including Pat Martino, Gil Evans, Toots Thielemans, Al DiMeola, George Benson, Earl Klugh, Larry Coryell, Bob James, Dave Liebman, Herbie Mann, Ray Barretto, the Brecker Brothers and others. Jeff Berlin was a regular member of Bill Bruford's band (which included Allan Holdsworth) for a couple years starting in 1977; four recordings resulted. Berlin moved to Los Angeles, worked in clubs with Scott Henderson and Frank Gambale, became an educator (helping to found the Bass Institute of Technology), played rock (including with Frank Zappa) and turned down an opportunity to join Van Halen. During 1985-86 Berlin recorded two fusion/rock dates for the soon-defunct Passport label. He moved to Florida in 1990 and has since toured with Yes, John McLaughlin, Billy Cobham, Kazumi Watanabe and other musicians from a wide variety of creative genres. In addition he started and teaches at the Players School. His third set as a leader, 1997's Taking Notes for Denon, is Jeff Berlin's most jazz-oriented set to date.